With potter Rachael Scharf's beautiful salad dressing maker, preparing your own at home is easy and fast. There's no comparison between the vivid flavors of homemade salad dressing and the tame ones in a store-bought bottle. Rachael Scharf's genius handmade bowl makes preparing your own delicious dressing (miso-ginger? 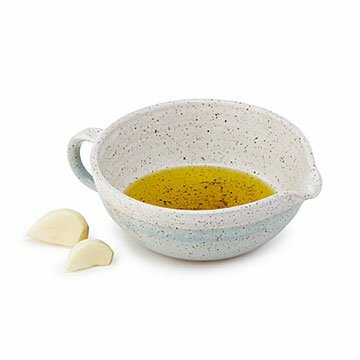 balsamic with a garlic kick?) a two-minute, messless proposition. Pulverize your aromatics on the bottom, whisk liquid ingredients together inside the vessel, and serve with the pouring spout. The speckle-glazed bowl goes seamlessly from kitchen prep to dining table. Paired with a recipe of your own or wrapped with a few special ingredients inside, it makes a most welcome hostess or housewarming gift. Instructions and a simple dressing recipe are included. Handmade in Brooklyn, New York. Rachael Scharf has always liked learning about what tools people keep in their kitchens. As a student at Franklin and Marshall College in western Pennsylvania, she studied anthropology while dabbling in ceramics on the side. After moving to Washington, D.C., she enrolled in a pottery wheel course. "It was my first experience throwing, and I became totally hooked," she remembers. So much so that she ended up spending seven months in Florence deepening her craft. After her DIY Italian education, Rachael moved to New York where, to hone her skills, she “buckled down and made what felt like millions of pots." A master at building useful pieces with a handmade feel, she loves being able to combine her love of food with her passion for ceramics in her Sunset Park, Brooklyn studio. Microwave and dishwasher safe. Hand wash for longest life of product.